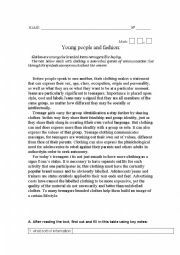 I am an English language teacher and I wish to share my worksheets so I may print yours, as well. 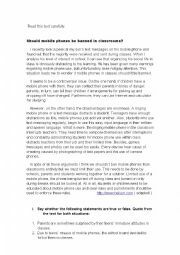 Text: Should mobile phones be banned from schools?" 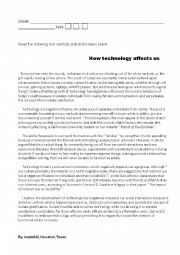 Learners are supposed to read a text about a current issue and deal with some comprehension exercises, rephrase some grammatical structures and also write an opinion essay about the given topic- forbidding the use of mobile phones in schools. Sts may practise comprehension, grammar and writing skills. Sts are supposed to put their comprehension, grammar and writing skills into practice. 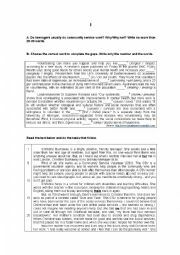 This is a test about volunteer work. It includes comprehension, grammar -rephrasing- and composition. 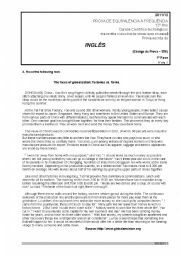 EXAM: "The faces of globalization"
This is an exam of technical english. Therefore, the main focus is on technical vocabulary. 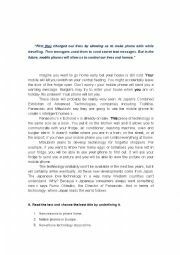 This is a test to enlight comprehension, grammar and writing skills about the different uses of mobile phones: more specifically, in the near future, they will help us to deal with our smart houses. Sts are given a text about a really serious problem which affects small children, teens, parents and everyone involved- bullying. After reading a testimony about someone bullied, learners may practise comprehension, grammar and writing exs. Learners have the opportunity to practise comprehension, grammar and writing skills. 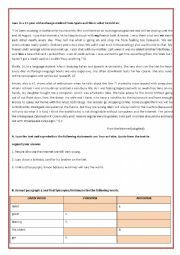 a comprehension, grammar and composition test. 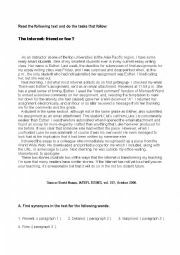 Users are supposed to rewrite the given sentences using the grammatical strutters, namely concessive or contrast and purpose clauses.